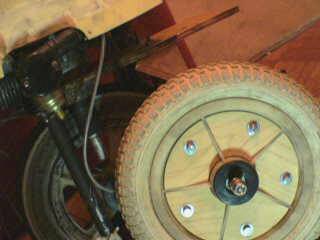 Here is a cheap and effective way to reinforce a plastic wheel. The wooden gear mount is 1 inch thick wood cut exactly the size of the plastic spokes. 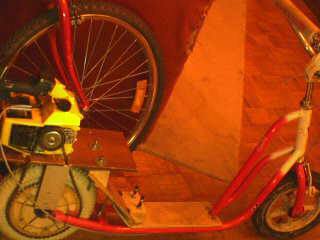 On the other side is 1 cm thick wood cut exactly like the others, the reason they don't fall out is that there is a 2mm thick plastic spoke strengthening support that the wood clamps onto (you can see it by comparing the 2 wheels, 52 tooth gear ). 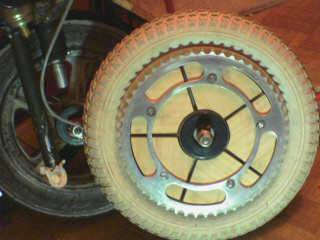 The gear ratio is 4.333:1 using a 12 tooth on the motor and a 52 tooth on the rear wheel. The gear on the clutch is 12 tooth and glued on with metal epoxy (the good stuff) seems to hold ok. 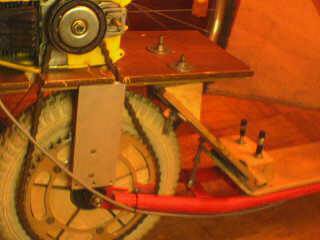 The chain saw engine is 38cc's and the cable was put through the hole I drilled in the plastic throttle trigger rod. In the last photo, the engine is a 1.2HP boat engine and it has a notched spindle that is fitted with an aluminum tube with a bar through it (to fit into the notch) and expanded with another aluminum tube over it and then a thick walled rubber tube over that, the engine is out of angle so it keeps the rubber/aluminum tube from falling off. 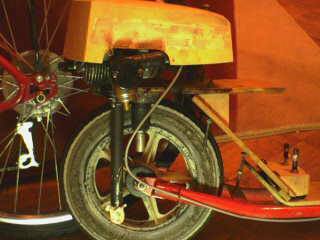 btw...the wheel with the sprocket is not used when motorized with the boat engine.